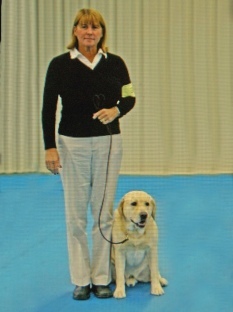 Darlene has been training and showing dogs for over 25 years. She breeds Labrador Retrievers and shows in Conformation and Obedience. She has worked as an Obedience Instructor for the City of Cocoa Beach teaching Puppy, Basic, Intermediate and Advanced Obedience Classes; Dr. Daniel Sims (Suntree Animal Clinic) teaching Basic Obedience to his clients and Barkingham Palace Pet Center for 5 years. There she taught classes in Puppy, Basic, Intermediate and Advanced Obedience; Agility and Conformation/Handling classes preparing owners and their dogs for the Conformation Ring. She also was in charge of training the owner’s Golden Retriever puppies for the breed ring. Darlene has titled dogs in Obedience/Rally, Dock Diving and Conformation and continues to show. She currently also has students competing in Obedience and Rally. Darlene is a AKC Evaluator. Darlene has years of experience in raising puppies and training dogs and puppies to show and most of all to be happy well behaved family members. She loves what she does and that shows in her commitment to training and helping family’s with their pet needs. Natalie Has been training dogs and teaching people professionally for over 17 years. She has a background in linguistics and psychology and she applies that knowledge and experience to the world of animal training and canine competitive sports. Natalie enjoys training and competing with her won dogs in a variety of sports, and has titled and worked her dogs in Scentwork, IPO (Schutzhund), and Obedience/Rally. She is a certified professional dog trainer, CTDI, AKC Scentwork Judge, USCSS Judge and CSD.